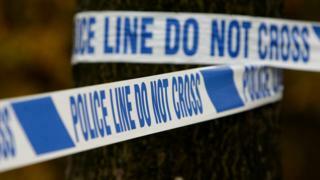 A teenager suffered a badly cut arm after he was attacked by a group of men wielding a machete. The attack in Westwood Road, Penhill, Swindon happened at around 19.20 GMT on Wednesday. The 19-year-old man sustained a large deep cut to his arm and was taken to the Great Western Hospital by ambulance. His injuries are not life threatening and Wiltshire Police are now appealing for witnesses. Det Insp Scott Anger said: "This incident has left the victim with a serious injury to his arm. "We are keen to hear from anyone who was in the Westwood Road area of Penhill between 7pm and 7.30pm, and anyone who witnessed an altercation in the area. "As yet, no arrests have been made but our enquiries are still at the very early stages." Officers have asked anyone with information to contact 101 and quote crime reference number 54190020126.